Falconry has a long history stretching from ancient Mongolia to Europe and the Middle East. Sam is introduced to “Shuja,” a Bedouin hunting falcon. Abdulla Al Ghamdi and two of my Saudi Bedouin military friends, brothers Majed and Fahad Olayan, dropped by my office a couple of days ago for a surprise visit with their Saker falcon “Shuja” (Arabic for courageous or brave). “Shuja” is being trained for hunting rabbits in the nearby deserts. The falcon, among birds known as “raptors” or “birds of prey,” has amazingly acute vision and can identify prey at a distance of several kilometres. It can fly at speeds of over 100 km per hour, approaching 200 km per hour during dives. 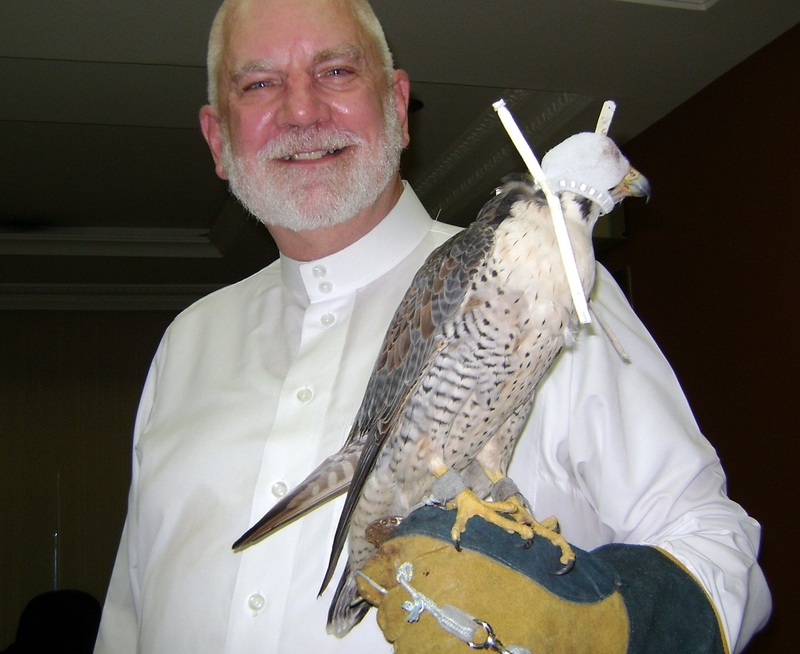 The art of falconry is a big deal here in Saudi Arabia, with well-trained birds selling for thousands of dollars. Falconry has been practiced in many forms for thousands of years by many cultures. Some specialists place falconry’s origins somewhere between 4,000 and 6,000 BC in the plains of Mongolia. Other historians believe that the practice could be much older, with its beginnings in the deserts of the Middle East, particularly here on the Arabian Peninsula. Wherever it began, falconry, which was originally used for subsistence and not sport, was well established in both Asia and the Middle East by 2,000 BC, and gradually made its way westward to Greece, Italy and eventually to Medieval Europe. Beginning in the early 6th century and extending through the Middle Ages, the popularity of falconry (or “hawking”) surged in Europe. It was the sport of royalty for centuries. The possession of falcons and other birds of prey was considered a status symbol. And talking about regulation, get this! By the 17th century in England, falconry came to be governed by a strict set of customs called the Laws of Ownership, which dictated the birds of prey that were permitted to be flown by citizens of various social ranks. For example, a king could fly a gyrfalcon; a duke, a rock falcon; an earl, a peregrine; a yeoman, a goshawk; and a servant, a kestrel. During the reign of Edward III, 1327-77, stealing a trained raptor was punishable by death. 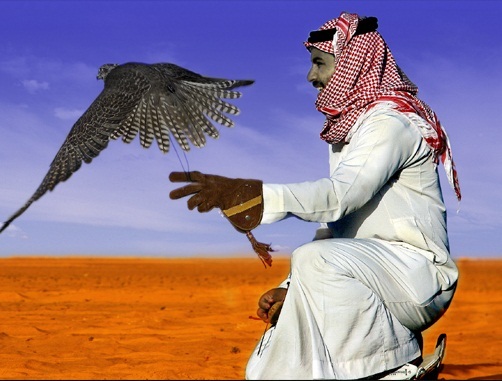 Falconry is believed by many to have been a part of Arabian Bedouin life for thousands of years. These ancient birds of prey are still used for hunting rabbits and desert quail. Once the pastime of the rich, falconry now continues as a highly structured sport that demands a lot of time and serious commitment. For some Bedouins it remains a primary method of hunting rabbits and other desert animals. Saudi birds are generally bred in captivity and when hunting, often have a small radio transmitter attached under the tail for tracking. Training a falcon is time-consuming and requires enormous patience since the falconer must carry the bird on his arm for several hours each day. That might be possible for the Bedouin, but try fitting that into a regular 21st century work schedule! 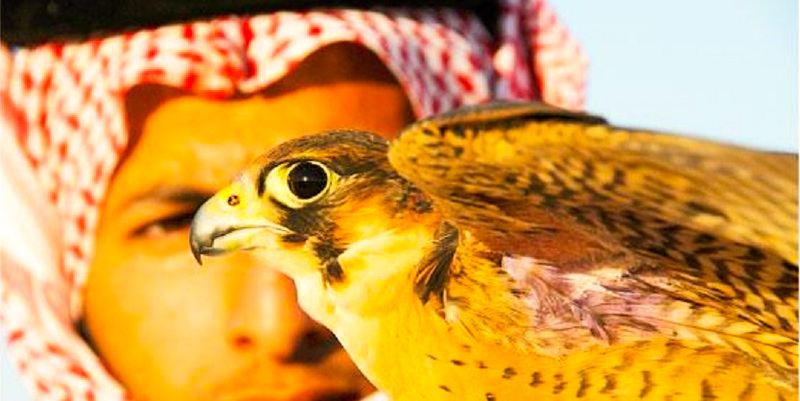 The falcon hunting season here in Saudi Arabia is from October to March. The two most popular falcons are the Saker and the Peregrine. The Saker is valued both for its outstanding beauty and for its ability to withstand adverse weather conditions. Because the Saker completes its annual moult early, it can start hunting in October, while the Peregrine may not have sufficient feathers until January. The motion picture industry has championed films like The Maltese Falcon and Day of the Falcon. And in America we have our Atlanta Falcons football team. Oregon has it’s Falcon Cove. The US Air Force has its Falcon F-16 and Raptor F-22 fighter jets. But certainly no man-made imaginary compares to God’s incredible creation of this eagle-eyed, warp-speed hunter of the Arabian Peninsula. 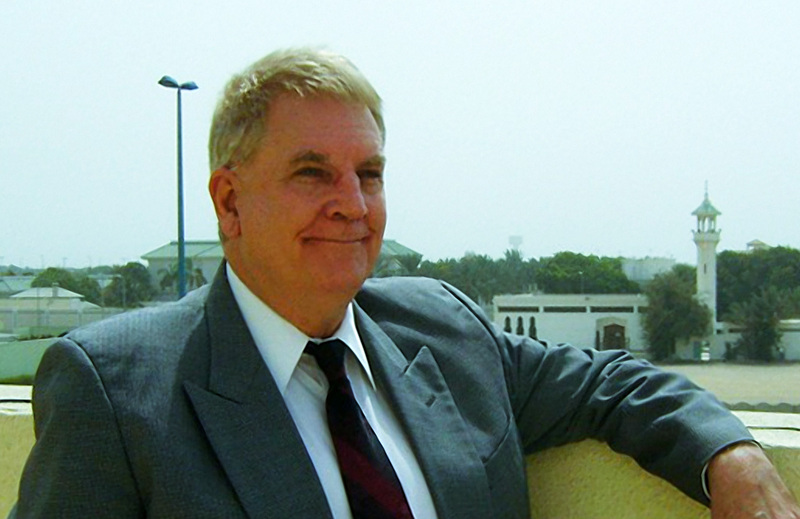 Sam listens to Adhan (Muslim Call to Prayer) from his Jeddah office balcony. Muslims, as you are aware, are a deeply spiritual people. Their Adhan, or “call to prayer,” can be heard five times a day from mosques in many nations and cities around the world. And for the overwhelming majority of Muslims, they bow prostrate before God, not simply because of tradition, but out of a sincere desire and yearning to communicate with the one true God. As I write this blog article on angels, I can hear the call to prayer coming from several mosques surrounding our office building on Corniche Road. To hear what I hear, click here. During that “week of angels” and for weeks later, my mind did focus on the fact that God does promise to provide us with comfort during times of trouble—and his angels (ministering spirits) are often assigned and commissioned to do just that. 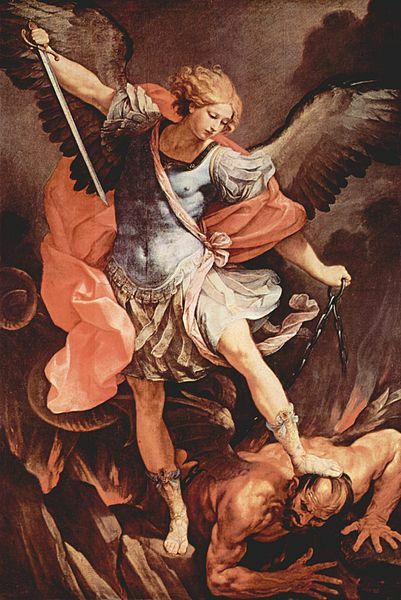 Guido Reni's Archangel Michael (in Santa Maria della Concezione Church, Rome, 1636) tramples Satan. A mosaic of the same painting decorates St. Michael's Altar in St. Peter's Basilica. 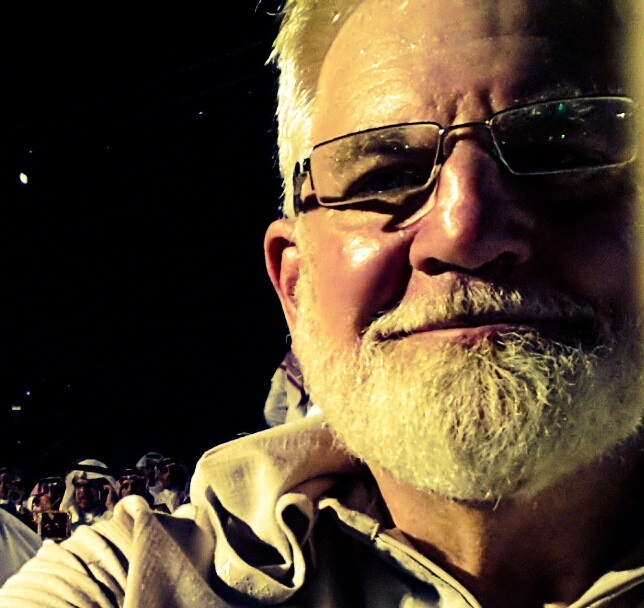 Since arriving in Jeddah, I have overheard a lot of discussion about angels who have been assigned by God to perform various services for his followers. Today, Dr. Waleed, my Egyptian colleague, told me about “Atid” and “Raqib,” two angels that are mentioned in the Qur’an. Both are watching our every move. Raqib records all the positive actions and thoughts, while Atid records the wrong things we do. All records are kept till the time of death or until the resurrection. All will eventually be revealed and weighed on God’s scales of justice, and on that great Judgment Day we will all be rewarded accordingly. While most American Christians seldom give a passing thought about the angelic realm, I find here in the Middle East a belief in angels is common to Muslims and historically to Christians and Jews. There are writings about the angels in all three cultures. In the Qu’ran we read, “Praise be to God, who created (out of nothing) the heavens and the earth, who made the angel messengers with wings – two, or three, or four (pairs) and adds to Creation as he pleases: for God has power over all things” [Faatir 35:1]. In all three faiths we are told that angels are never to be the objects of worship. Such worship is condemned by Jewish rabbis. The Palestinian Talmud remarks that there is no need for Jews to pray to God through the mediation of the angels. In the Babylonian Talmud it is implied that one of the angelic functions is to bring the prayers of Israel to the throne of God. However, we are told that “the angel” often came bringing an urgent message and uttered a message as if God were speaking directly to humankind. In the Jewish faith, the “angel of the Lord” gave directions and messages at very important times in history. Many Christians believe that the “angel of the Lord” mentioned in the Old Testament is a “theophony”–a pre-New Testament appearance of Jesus Christ. In the Christian New Testament, there are many references to angels (Greek / ἄγγελοι “messengers”). In the gospels, we read that God sent angels to minister to Jesus after he was tempted and severely tried by the devil (Matthew 4:11). On another occasion we read that an “angel from heaven” strengthened Jesus prior to his passion, empowering him to endure suffering and the cross (Luke 22:43). In other places we read that God’s angels strengthened the Christian believers as they spread the gospel message throughout the world. The followers of Jesus are told by the writer of the Epistle to the Hebrews, “Do not neglect to show hospitality to strangers, for thereby some have entertained angels unawares.” (Now remember that the next time a stranger shows up at your front door at 3:00 AM!) The Rule of St. Benedict speaks of this, when monks receive guests. The “unawares” implies a sense of mystery, of not fully understanding what is going on. According to the Midrash Tehillim, Jews are taught that God’s angels wait until all Jews finish their morning prayers, and then they weave these prayers into a crown which they place on God’s head. Early Christian theologians conveyed that angels are divided into ranks of authority and service. Pseudo-Dionysius, in his work The Celestial Hierarchy, and Thomas Aquinas, in his Summa Theologica, drew on passages from the New Testament (specifically Ephesians 1:21 and Colossians 1:16) in an attempt to develop an outline of three hierarchies – spheres or triads of angels – with each hierarchy containing three orders. Although both authors drew on the New Testament, the biblical canon is relatively silent on the subject; thus speculation about these hierarchies is somewhat questionable. Muslims, Christians and Jews mention several “archangels” in their writings and traditions. Of the seven archangels in the angelology of post-Exilic Judaism, only Michael (Daniel 12:1) and Gabriel (Luke 1:19-26) are mentioned by name in the scriptures that came to be accepted as canonical by all Christians. However, Raphael is mentioned by name in the Book of Tobit, which is accepted as canonical by Roman Catholic and Orthodox Christians. Another four archangels are named in the second century B.C. In the Book of Enoch (chapter 21), Uriel, Raguel, Sariel, and Jarahmeel are mentioned. I will address three archangels that are common to all the Abrahamic faiths. 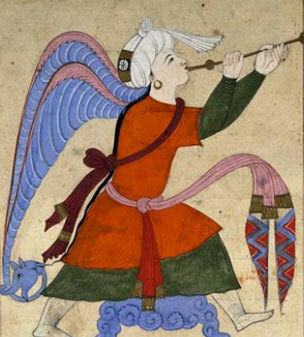 Muslims believe the archangel Rafael will sound the trumpet at the great resurrection and Judgment Day. First, Gabriel (Hebrew: גַּבְרִיאֵל, “God is my strength”; Arabic: جبريل, Jibrīl or جبرائيل Jibrāʾīl) is an Archangel who typically serves as a messenger to humans from God. In Islam, Gabriel is described as the “chief of the four favored angels” and “the spirit of truth” and according to some Muslim scholars, Gabriel is the same person as the Holy Spirit. Christians and Muslims believe Gabriel to have foretold the births of John the Baptist to Zacharias and the birth of Jesus to the Virgin Mary. Muslims believe Gabriel was the medium through which God revealed the holy Qur’an to Muhammad. In English-speaking culture, a familiar depiction is the portrayal of Gabriel blowing a trumpet blast, signifying the end of time and the general resurrection at the Last Judgment. But neither the Hebrew Bible or the New Testament indicate a particular angel for this particular task. In Islamic tradition, though not specified in the Qur’an, the trumpeter sounding the trump of doom is not Gabriel, but Rafael (Israfil). Since neither Gabriel or Rafael is assigned this task in any of the holy books, we’ll just have to wait and see which archangel shows up to blow the trumpet! Raphael (רפאל, Hebrew for “God has healed,” “God heals,” “God, please heal!” Arabic: سرافيل‎, Isrāfīl), the name of the archangel in Judaism and Christianity who performs all manner of healing. The Hebrew word for a doctor of medicine is Rophe and is connected to the same root word as Raphael. Created at the beginning of time, certain Islamic sources indicate that Raphael possesses four wings and is so tall as to be able to reach from the earth to the pillars of heaven. A beautiful angel who is a master of music, Raphael sings praises to God in a thousand different languages, “the breath of which is used to inject life into hosts of angels who add to the songs themselves.” As we mentioned above, according to Islamic tradition it is Raphael who blows the trumpet signifying the great resurrection and final judgment. Michael (Hebrew מִיכָאֵל‎ Micha’el or Mîkhā’ēl; Arabic: ميخائيل Mīkhā’īl) is an archangel in Jewish, Christian and Islamic teachings. In the Hebrew Bible, Michael is mentioned three times in the prophecies of Daniel, once as a “great prince who stands up for the children of your people.” The idea that Michael was the advocate of the Jews became so prevalent that in spite of the rabbinical prohibition against appealing to angels as intermediaries between God and his people, Michael came to occupy a certain place in the Jewish liturgy. When Sam's daughter Janulik was a child, he hung this picture by her bed. 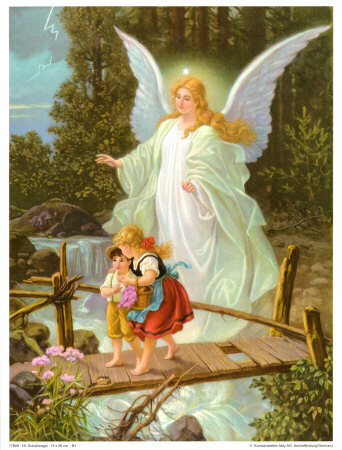 Children are naturally fascinated with angels. I remember telling my todler daughter Janulik about her guardian angel. She and I hung a picture of a guardian angel next to her bed. For centuries, angels have captured the imagination of artists. A new exhibition at the Israel Museum in Jerusalem called “Divine Messengers: Angels in Art” currently displays 30 art works. Most the art on display is from the museum’s own collection in which these heavenly beings are often portrayed as winged creatures. You can watch a brief video about the exhibit by clicking here, or if you prefer, you can read a published article about the art pieces by clicking here.